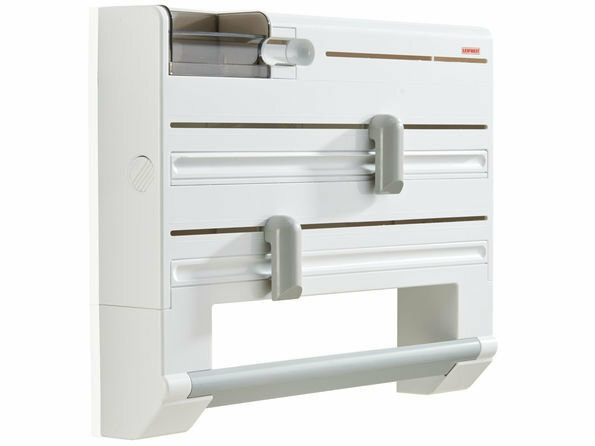 That is the way, how to work: the wall-mounted roll holder Parat Plus offers in a flash everything that is needed again in between times. Two closed containers offer space for aluminium foils and cling films. A compartment is for freezer bags. In addition there is dispenser for Sellotape as well as a box for small pieces where rubber bands, drawing pins, paper clips or clips for closing can be stored. An additional holder is for kitchen rolls. The wall-mounted roll holder Parat Plus had special blades that cut aluminium foils and cling films neat and precise, without crooked, picked tearing edges and without fiddling on the cling film, because the foil end is not found. After the cutting the foil ends are again ready to hand and can easily be cut. The razor-sharp blades are hidden behind the ergonomic shaped cutter, free from the risk of injury. After the assembly the wall-mounted roll holder can be stored from the front wall easily and comfortable. Remove the container, put the roll in and the Leifheit wall-mounted roll holder is ready for use. It is suitable for all commercial roll sizes.